Jen Maseda (right) interviews Framingham native Nathalia JMag, the celebrity designer from Project Runway. Jen Maseda has long believed that women lack the networking opportunities men enjoy. “All around us are women doing amazing things, and yet we don’t always realize it,” said Maseda, founder and president of the MetroWest Conference for Women. 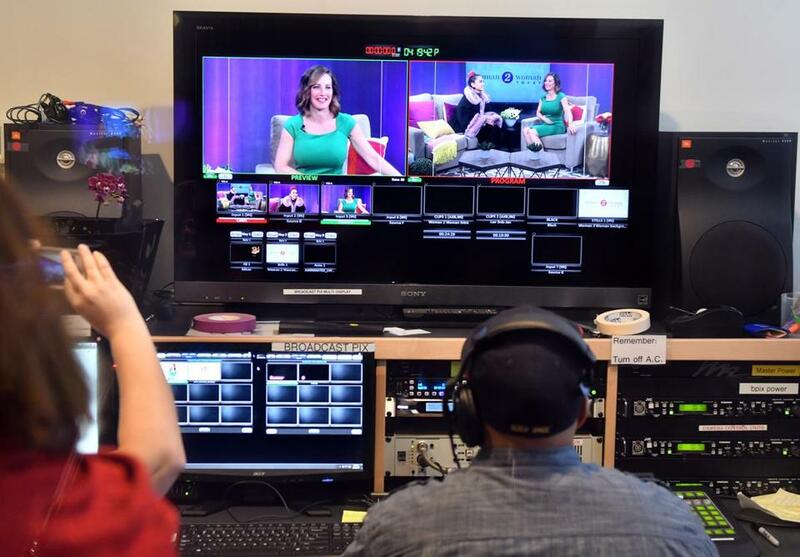 So when Access Framingham TV approached her about hosting a weekly show, the 44-year-old Natick resident pitched an idea. 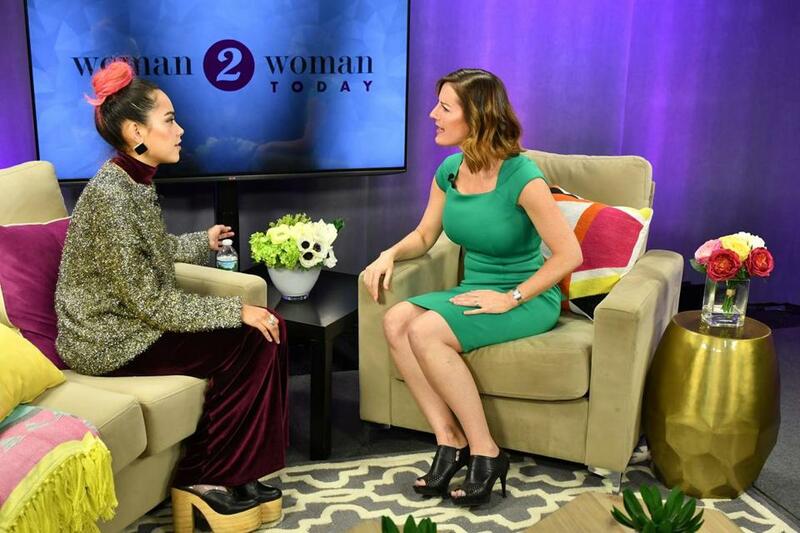 Thus was born “Woman2Woman Today,” an interview-format talk show hosted and executive produced by Maseda, which celebrates its first anniversary with the public access television station this month. Twenty-two shows in, Maseda is convinced that she is on to a good thing. The show has been picked up by local cable stations in Ashland, Hopkinton, Franklin, and Natick and as far away as New Jersey, Texas, and California. Maseda created the soundstage herself, designing it to look warm, welcoming, and somewhat feminine, with cozy furniture and bright colors. But occasionally she and the crew leave the set to tape guests in more natural environments, such as when her guest was a lawyer who competes as a log roller and ax thrower. Another well-received guest was Dr. Patti Fletcher of Natick, an angel investor and current Executive in Residence at Babson College’s Women Innovating Now (WIN) Lab. When Fletcher appeared on the show, Maseda invited two young female entrepreneurs to pitch their products to her, and Fletcher helped them refine their approaches. Multiculturalism is a priority for Maseda as well. “We’ve had guests who talk about being Latina, African-American, Puerto Rican. The show is representative in that way of Framingham and the greater community in which we live,” she said. To celebrate the show’s first anniversary, Maseda taped two episodes, to air in early April. The first featured Framingham’s own Nathalia JMag, the celebrity designer from Season 15 of “Project Runway,” and the second showcased Kristina Tsipouras, a local entrepreneur, CEO of Moroccan Magic, and founder of Busy Girl Consulting and the Boston Business Women’s Conference. Taped on Sunday afternoons, Maseda’s show receives technical support from studio operations manager Shavarsh Morrissey, assistant producer Jessica Friswell, and intern Meredith McKunes. But she has a lot of personal boosters as well, as demonstrated at the anniversary taping in mid-March. Her husband, Luis, and children, 9-year-old Bella and 7-year-old Sebastian, dropped by the set to cheer her on as she mic’d up, as did former guest Patti Fletcher with her two daughters — though in truth, several of the youngsters who eventually crowded into the sound booth to watch the taping were more interested in Maseda’s first guest that day, the exquisitely stylish Nathalia JMag, than the importance of the anniversary being celebrated. As Morrissey sees it, what Maseda is doing is a perfect match for Access Framingham TV. Producer Shavarsh Morrissey runs the control room as Jen Maseda interviews Framingham native Nathalia JMag.